As a parent, enrolling your child in swim lessons gives you peace-of-mind that your child is becoming water safe. 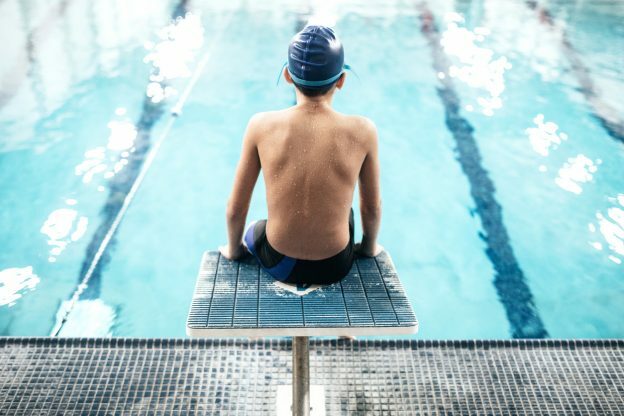 Unfortunately, for many children, swim lessons mean struggling in a new environment, fear and frustration. With such vastly different views of this activity, how do we create lessons that teach kids what they need to know and create a positive experience for them? Well, it’s simple really, we create engaging lessons and utilize tools at our disposal–one of which is the swim cap. Although chlorine effectively neutralizes harmful bacteria in the water, it is detrimental to maintaining healthy hair. A properly sized and positioned swim cap reduces the amount of chlorinated water that your hair will come in contact with while swimming. Getting comfortable in the water and learning the necessary skills to be a successful swimmer is challenging enough without battling against the added drag that a swimmer’s hair causes. Swim caps reduce this drag, making swimming more fluid and effortless for your child. For those with longer hair, a swim cap is very effective at keeping your child’s hair out of their face, which not only serves as a nuisance and distraction in the pool but also prevents them from properly seeing in the water. In brief, swim caps are great tools to maintain strong healthy hair in the swimming pool and make swimming as easy and natural for your child as possible. Much like with goggles, swim caps should be considered regular swim gear. And for those worried about swim caps ruining your look for the pool, the caps come in a wide assortment of colours and designs, so you can find the best one for you!